As I post this on Saturday evening our part of the Plateau is under a Winter Weather Advisory. We could get an inch or two of snow. While Betsy is delighted at the prospect I am decidedly less enthusiastic. I’ll admit that I’m looking forward to warmer weather. With that in mind, I decided to post the above picture as my contribution to Scenic Sunday. Betsy and I try to get to the beach each year for several days. We usually go to the area around Little River, South Carolina. We go there because I lived in Little River for three years before moving to Tennessee and meeting Betsy. This particular picture was taken in June, 2001, on Sunset Beach, North Carolina, just north of Little River. Sunset Beach is an island off the coast which is primarily residential in nature. Most of the houses are single family and it is much less ‘touristy’ than Myrtle Beach. It is possible to walk down the beach beyond the homes. Once past the homes it’s easy to forget that their are other people around at all. There is just the sea, the sand and the dunes. 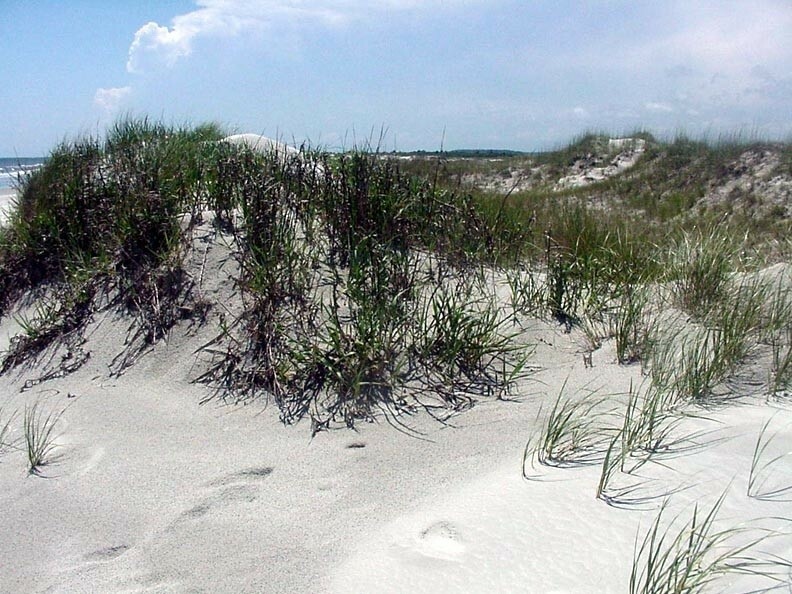 This picture shows the grass on some low dunes above the high tide mark. Sunset Beach may not quite be a tropical paradise, but it is pretty close. 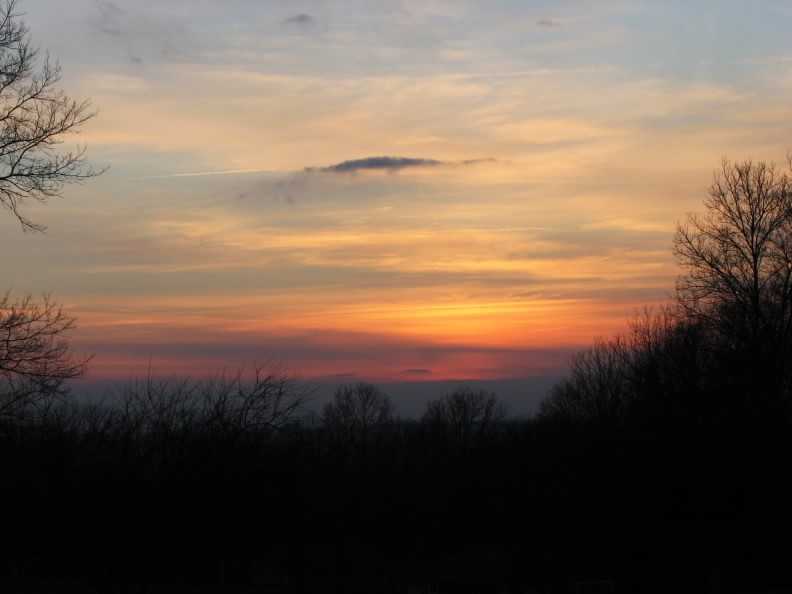 To see more Scenic Sunday pictures, or to join and post your own pictures, click HERE. Just a reminder that you are invited to visit my photo blog, Photos by Senior Hiker, by clicking HERE. Twin Falls, Rock Island State Park, Tennessee. June, 2006. On my last Watery Wednesday post (HERE) I mentioned that the Caney Fork River flows past the base of Twin Falls in Rock Island State Park here in Tennessee. Several people said they would like to see the falls, so Twin Falls are the subject of this posting. 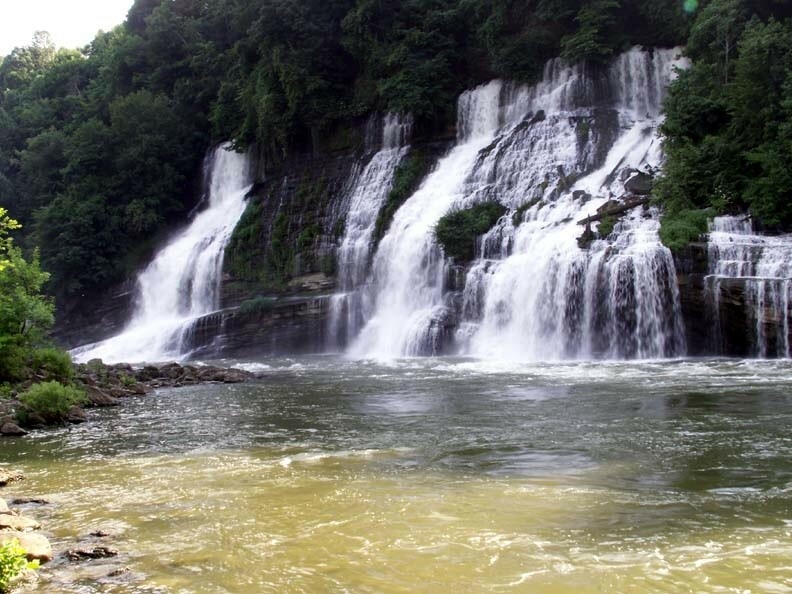 Twin Falls is formed by water gushing from a steep hillside and tumbling 65 to 80 feet into the Caney Fork. Twin Falls did not appear until after the construction of Great Falls Dam. The Collins River is immediately behind the hill from the Caney Fork, and it is speculated that when the dam was built forming Great Falls Lake, water began seeping into caverns thought to be inside the hill. The water had to go somewhere, so it proceeded to ‘leak’ out the other side, forming the falls. Attempts were made to patch up the leaks, but to no avail. Hydrologic engineers have concluded that the hill is not in danger of collapse, so Rock Island now has a ‘quasi-natural’ waterfall. Regardless how it was formed, we think Twin Falls is a pretty addition to our collection. On a slightly different note, I have started a second blog. I have long wanted a place where I could post pictures that I like. I anticipate that this will continue to be my main blog and that the new blog will be mostly pictures with enough information to identify what is being shown. I probably will not post every day, but I will add new pictures as I find them in my files. If you would like to visit Photos by Senior Hiker click HERE. 30 Mile Point, New York. October, 2008. Back in October, Betsy and I went to Buffalo, New York, to visit my daughter Kelly and her husband, Chuck. On Friday they took us on a ride out in the country around Buffalo. It wasn’t an ideal day for sight-seeing because there were showers off and on for much of the day. 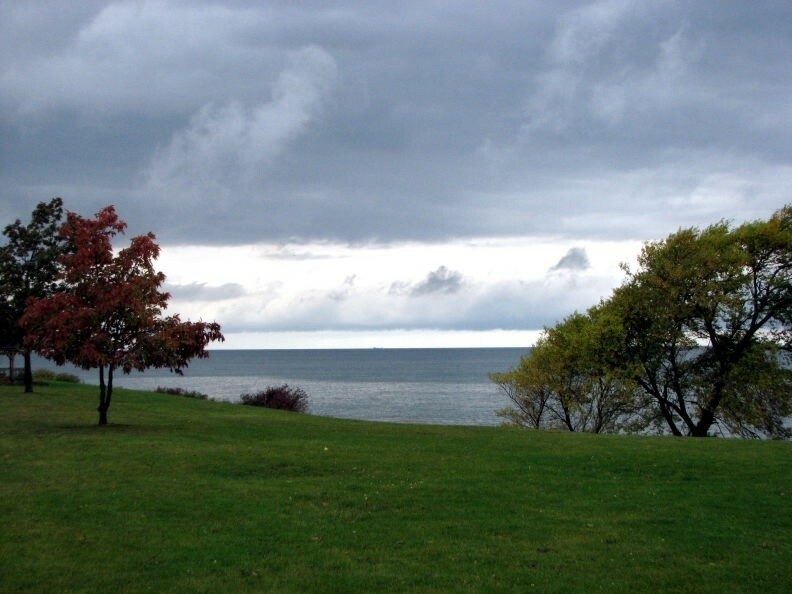 One of the places we visited was 30 Mile Point on Lake Ontario. There was a park there, and a lighthouse, which we enjoyed seeing. While on the lighthouse grounds I took this picture of the lake. It wasn’t raining at that particular moment, but you can see the clouds scurrying across the lake. This is my entry for Skywatch Friday, a weekly meme of sky pictures from around the world. To see more pictures, or to post your own, click HERE. The pulpit in St. Michael's Church, Charleston, South Carolina. June 22, 2008. 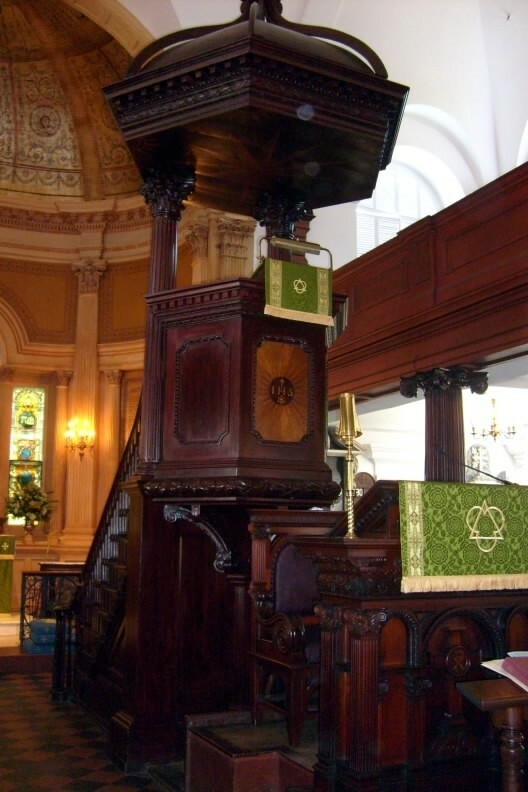 The picture above was taken in June, 2007, of the pulpit in St. Michaels Church, Charleston, South Carolina. Betsy and I attended Sunday services at the church and toured the sanctuary after the service. St. Michael’s Church is the oldest church building in the City of Charleston, standing on the site of the first Anglican Church built south of Virginia. The cornerstone for St. Michael’s was laid in 1752 and in 1761 the church was opened for services. The only change to the structure of the building was the addition of a sacristy in 1883. St. Michael’s is one of the few city churches in America that has retained its original design. The pulpit is the original one, remarkable for both its height and the sounding board supported by two Corinthian columns. The panel on the front of the pulpit was taken as war booty after the War Between the States and then later voluntarily returned and replaced on the pulpit. The base of the pulpit still shows the scar caused by a shell which exploded in the church during the Federal bombardment of the city in 1865. The pews in the church are very much as they have always been. There is a large, long double-pew in the center of the church, No. 43, originally known as “The Governor’s Pew”. George Washington sat in that pew during worship on May 8, 1791, and General Robert E. Lee worshipped in this same pew during the first year of the Civil War. St. Michael’s is a beautiful church. If you are interested, more pictures of St. Michael’s Church can be found HERE. The Caney Fork River at Rock Island State Park, Tennessee. This is my entry for Watery Wednesday. To see more pictures of our watery world, or to join in the fun and post your own pictures, click HERE. 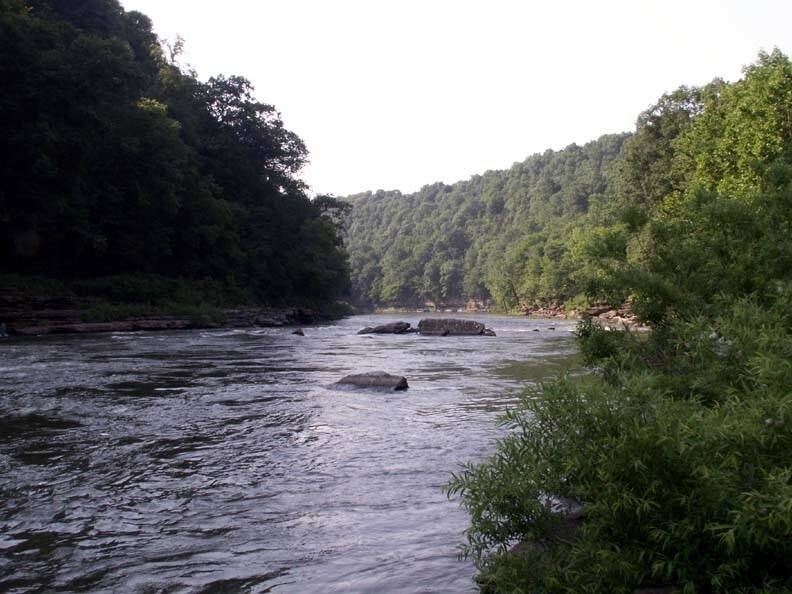 The picture above is of the Caney Fork River in Rock Island State Park, here in Tennessee. The Caney Fork flows through the park. This picture was taken just downstream from the base of Twin Falls. The reason the river looks so placid is that the river does not go over Twin Falls, but past the falls. Although we haven’t done a great deal of hiking in Rock Island, the park does contain three major waterfalls and a couple of minor falls. It’s another of the wonderful parks in the Tennessee park system. My first home in Lakewood, Ohio, circa 1963. I apologize for the quality of the picture above — it’s a scan from a slide made over 45 years ago. This house was my first home after graduating from college — not bad, huh? Actually, I only lived in part of the second floor. I can’t remember how I found out about the house — I think I read about it in an ad in the Lakewood paper. But somehow I contacted the elderly couple who owned the house and who were looking for renters. They had a bedroom with private bath and a shared kitchen for rent on the second floor. There was a separate entrance for me to use to get to the room. Since I thought what they were asking was very reasonable, I took the room. The good Lord takes care of Indiana farm boys in the big city. When I moved to Lakewood in August prior to beginning my teaching job, I found that the other room for rent had been rented to another new teacher at Marshall. Larry taught English and was from southern Ohio, which is about as rural as my home in northern Indiana. Larry and I were able to carpool to school almost every day that year. The house, as you can see, was very spacious and in one of the older neighborhoods of Lakewood. It was only about two blocks off the lake and I will admit that I enjoyed living there very much. Unfortunately in the spring of that first year the owners sold the house to a younger couple, so I had to get myself another place to live. But this house was an important part of my world for nearly a year. 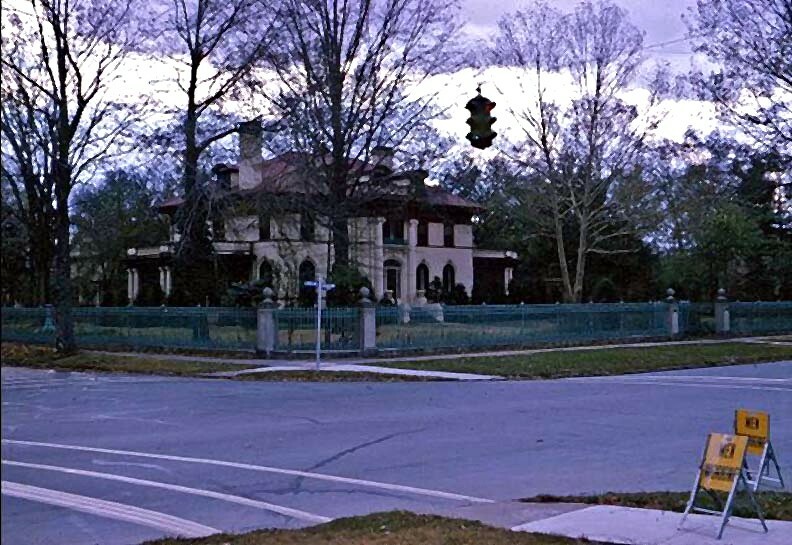 When showing Betsy around some of my haunts in 2002, we drove past this house and it was still there. To see more of our wonderful world, or to join and share your part of the world with us, click HERE. I was surprised to find the box in the picture above leaning against the front door Saturday afternoon. Betsy and I were busy working with our new computers and we didn’t even hear the mailman come to the front door. I recognized the box as soon as I saw it — I didn’t even have to read the name. 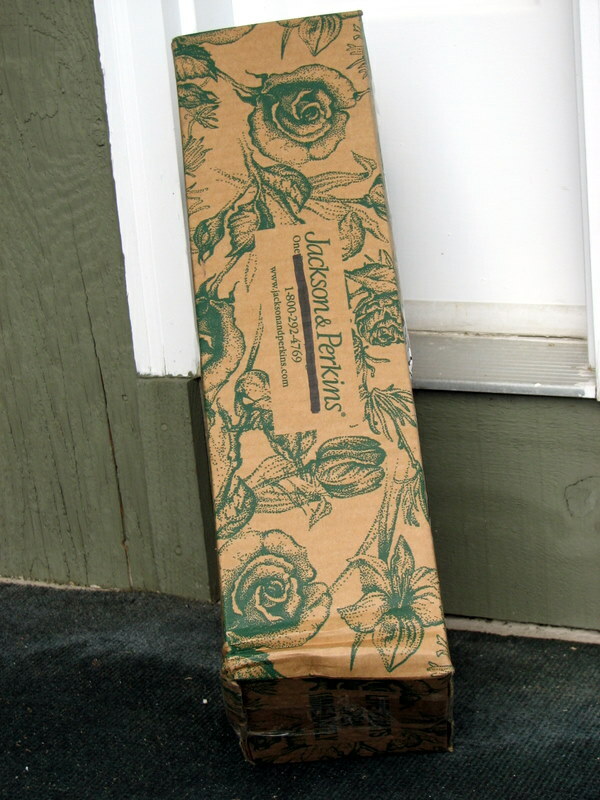 I’ve been a customer of Jackson & Perkins for many years, and I knew that we had just gotten a bare-root rose which we ordered for our garden this year. The reason I was surprised is that Jackson & Perkins does a good job of getting roses to the customer at the proper planting time. And quite frankly, I was expecting to be planting roses anytime soon! Rose Spellbound, Fairfield Glade. June, 2006. 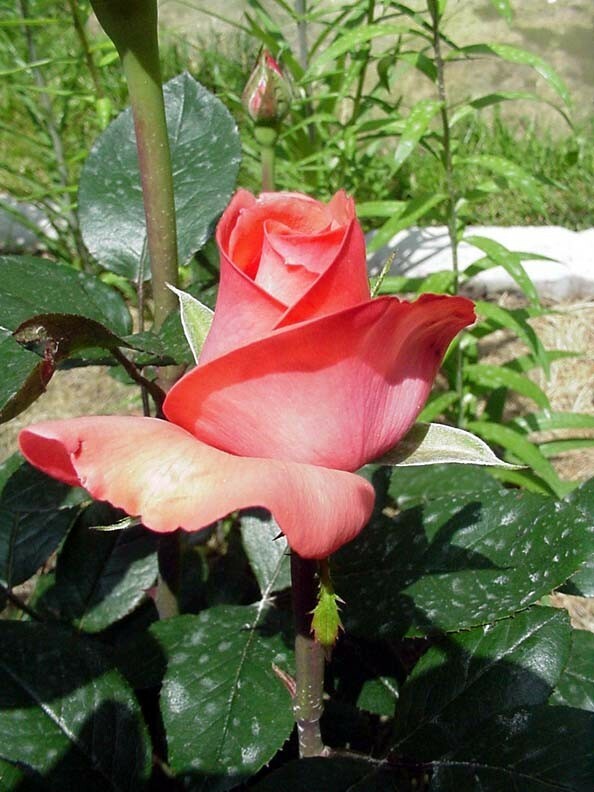 This rose, Spellbound, is a replacement for a plant we’ve had in our garden. The picture at the right shows Spellbound in 2006, the year we planted it. But two years of drought had reduced it to a single blossom on a weak stem last year. Since we like Spellbound when it’s healthy, we decided to try again with a new plant. So I was delighted with this sign from Jackson & Perkins that spring is near. The only problem is that we got the rose Saturday afternoon and it snowed Saturday night! Oh, well, at least Betsy was happy. Sunrise on Mt. Nebo, Arkansas. December 4, 2008. This is my post for Scenic Sunday. You can join and share your scenic pictures with us, or visit beautiful scenes from around the world, by clicking HERE. The picture above was taken last December at Mount Nebo State Park in Arkansas. Betsy and I got up early one morning and went to Sunrise Point, which overlooks the Arkansas River valley. 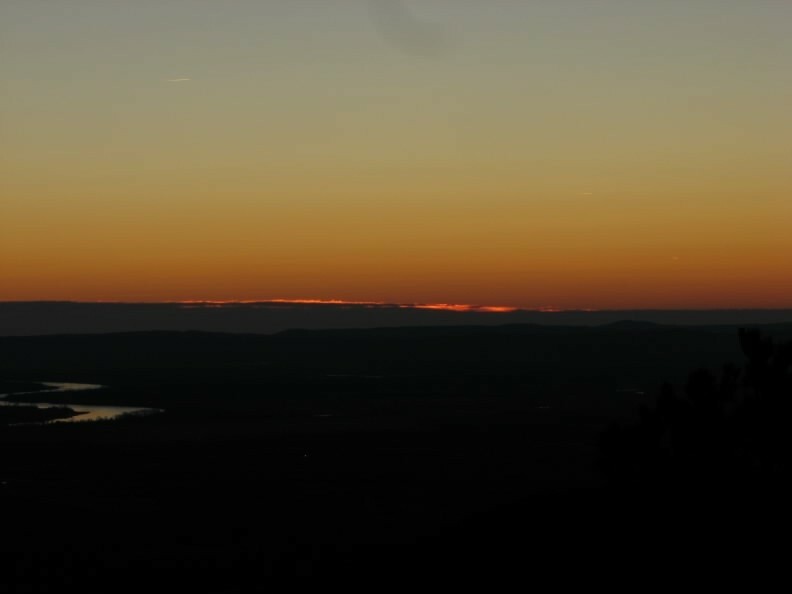 In the picture, which can be enlarged, you can see the river at the extreme left, which is just beginning to show some reflected color from the rising sun. The sun has not yet risen above the mountains on the other side of the valley, but the low clouds in the east are already sunlit. It was the beginning of a beautiful day. 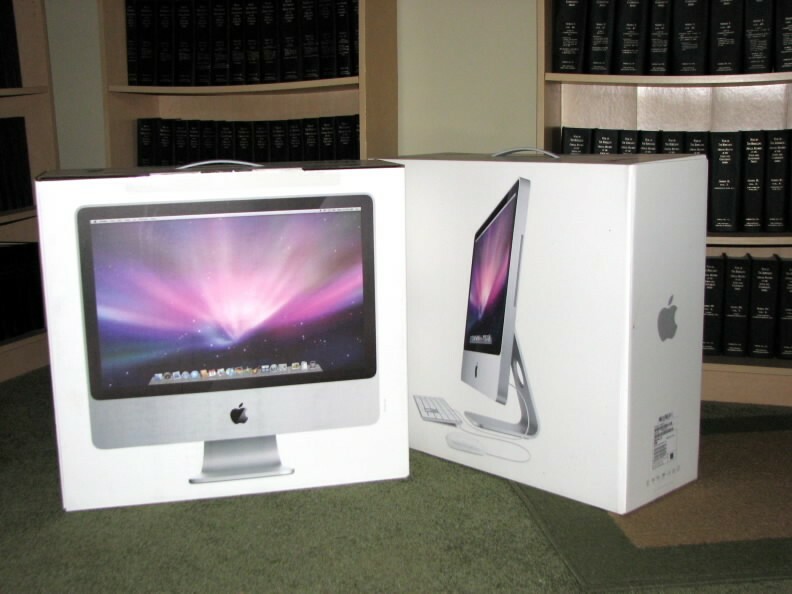 I’m happy to report that both Betsy and I are now using our new computers. We had a small hiccup or two, but the file transfers went well. I know I’m very happy with my new computer, and I think Betsy is as well. Our new computers. February 20, 2009. Betsy and I have been doing our part to help the economy. So if things don’t improve soon, it won’t be because we haven’t been trying. Yesterday we had to take our Prius into the dealership for her 120,000 mile service. Let me just say that the service required was fairly major and I’m sure we helped contribute to the paychecks of at least a couple of mechanics. We then headed over to the Apple store and made a MAJOR contribution to the economy. We’ve been discussing new computers for over a year now, and we finally decided to take the plunge. We like our Macintoshes and so we stayed with them. Now all we have to do is transfer our files from the old computers to the new computers. Hopefully much of that will be done overnight. But if you don’t hear from us for a day or two, you know we’ve encountered a problem. Sunset in Fairfield Glade. February 8, 2009. This is my entry for Skywatch Friday. Last week over 300 people from around the world shared their views of the sky. To see more sky pictures, or to join the fun and join, click HERE. Earlier this month I took my walk a little later than I usually do and captured the sunset above. I usually view the sunset from the 14th tee of the golf course, but this picture was taken from the first tee. This fairway is not quite as wide as the 14th and it is more level so the trees appear more numerous, but the sky is as glorious as ever.